Today we conclude "Foxy Ladies" week with someone who is NOT a lady, but he would believe himself to be a "fox". A WWE legend so despised by the male audience, whom he degraded regularly, yet the women in the stands went ga-ga for. After his matches one lucky gal would even get a kiss from the big stud. This lady-killing, piledriving machine is the "Ravishing One", Rick Rude. Quick note: I believe this is the first time I include a shot of the actual Legends packaging. As you can see it's a large blister card with Legends logos packed-in. Unlike the boxes the Elite figures come in, the Legends packages are not resealable. Rude was one of those heels that you really hated because he was so arrogant. Before matches he performed this very suggestive hip shaking dance as he removed his robe right in the center of the ring. He had several historical feuds during his time in the WWF, including one with the Ultimate Warrior. Rude also wrestled in the WCW before returning to the WWF and being part of the initial line-up of D-Generation X, albeit in more of a managerial role. Sadly, Rick Rude passed away in 1999 due to heart failure contributed to several factors. But do not despair because Mattel's first version of Rick perfectly immortalizes the arrogant grappler in this excellent "Legends" offering! Classic Rude right here folks. Kind of makes you want to punch him right in the face, doesn't it? He's ready to plant one on a random woman in the audience. He shares his torso sculpt with Randy Orton, being that both are slim, but impossibly ripped. Rude is also sporting taller mid-calf boots, which I've noticed on many of the Legends figures. It seems these were more popular back then as opposed to the boots just below the calf like Orton's wearing. The shoelaces and soles are sculpted on with great detail. Rude's tights have a lava lamp-like pattern on them with his portrait stamped right on his crotch. I guess you can say that's cocky (wink). "HEAT RETURNS" is printed down the length of each leg in block lettering with a spiky border around the letters. 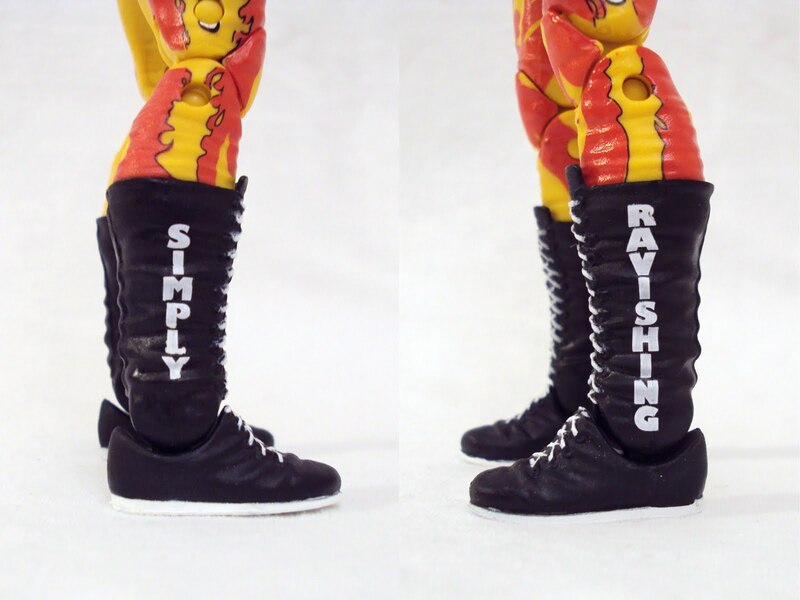 "Simply Ravishing" is divided between each of his boots. All the lettering is crisp and looks good inspite of the fact that it's white printing over black boots. Even the paint used for the shoelaces was applied well. As noted above, Rick's got all the necessary articulation to take hold of an "opponent" and give them the old "what for". Just in case you're a bit confused by the image above, Rude DOES retain the Elite/Legends-level articulation model and everything works as it should. However, it can be a little tricky posing him while performing the "Ravishing" Neckbreaker on another figure due to the single hinged elbows. You know what would be awesome, Mattel? Dual-hinged elbows! Apart from the requisite name tag and dispaly stand, Rude is packaged with his entrance robe. It's made of a silky cloth with a double-stitched collar and features a little velcro patch to keep it closed on the front (he doesn't like showing off his bits until he's center ring). The back features "Simply Ravishing" printed in gold lettering and little gold specs are spread across the entire robe making it all sparkly in the light. "Ravishing" Rick Rude is another solid entry in the very awesome WWE Legends line. The likeness is fantastic and the figure displays very well alone or on a shelf full of legendary wrestlers. If you were a fan of pro-wrestling, and more specifically the WWF, during the early '90s, this is a must own figure and you won't be disappointed.